No additional charge for medications. If someone other than yourself will be picking up your dog(s), you must let us know who it will be and they will be required to show a valid ID at pick-up. Boarding rates are calculated like a hotel. 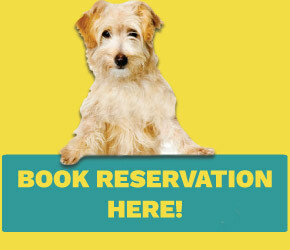 The day you check in you pay for that night, regardless of what time you check in your pet, daycare is included. On the day they are leaving, Check out time is 11:00am Monday-Friday, 11:00am on Saturday & Sunday, and 9:00am-1:00pm on Holidays. If your pet checks out after U Lucky Dog’s check out time, you will be charged for a full day of daycare. If your pet stays after business hours, then you will be charged for another night. U Lucky Dog Daycare requires a deposit equal to a one night stay of the room you request per dog. Cancellations must be 48 hours in advance or a one night deposit equal to the room you requested for the amount of dogs will not be refunded. Major holidays including Thanksgiving, Christmas Eve, Christmas and New Year’s Day, our office will be closed and there will be no pick-ups/drop-offs. For other holidays our office will be open from 9am-1pm for boarding pick-ups/drop-offs only, no daycare.